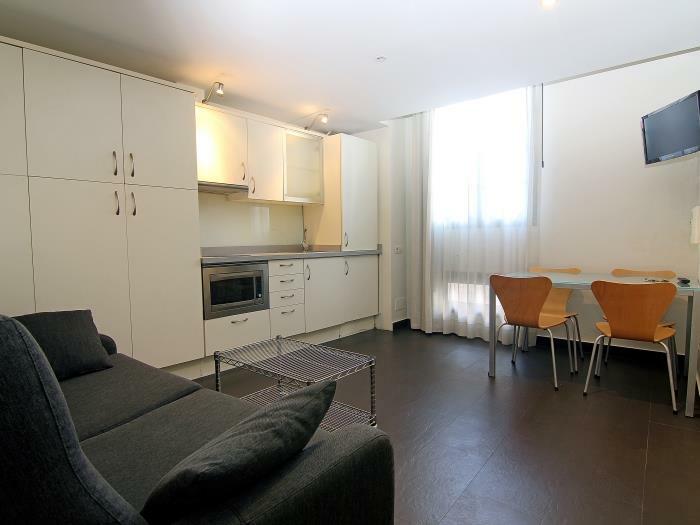 Uma zona privilegiada do bairro do Born andando poucos minutos estará nos principais pontos turísticos do centro de Barcelona como: Ramblas, Catedral, Praça Catalunha, Passeig de Gracia entre outros. A pé 10 minutos das praias de Barcelona, onde desfrutar do sol e duma ampla gama de restaurantes, lojas e locais de lazer. Junto ao apartamento está a estação de comboios, várias linhas de metropolitano e autocarros que permitem o acesso a qualquer ponto da cidade. Fantastic location! Fun to have the elevator open directly into the apartment. Single beds could be pushed together. Rooftop terrace was a nice plus. We were there in the winter and floors were quite cold. A rug might warm up the space a bit. Enjoyed our stay and would return. once again, a great stay in Barcelona. a wonderful location to base yourself. very central, if you wish to go to the beach, or visit sites. staff are very helpful and completing the booking and payment is very simple. takes all the hassle out of planning a holiday. highly recommend, and hope to be back again next year! a special thanks to David, who met us when we arrived. a true gentleman. The apartment as such, was ok, well equipped, clean, adequate furniture.But, first night only boiling hot water. Not possible to take a shower. The heating did not work and it was cold. Classbedroom: we are sorry that the boiler didn't work on the first night, we hope the rest of the stay was good. Classbedroom: Entendemos el problema con la presión de agua. hemos conseguido finalmente conseguir mas presion. Después de su feedback introducimos unos focos en la terraza. Gracias por el feedback. great people to deal with. splendid location, close to beach and city center. for a large city it was a very quite location. great bars and restaurants close by. an elevator which is a blessing! highly recommend. one of the best we've dealt with! Trumpetes ppwas a great location with good security within the building. 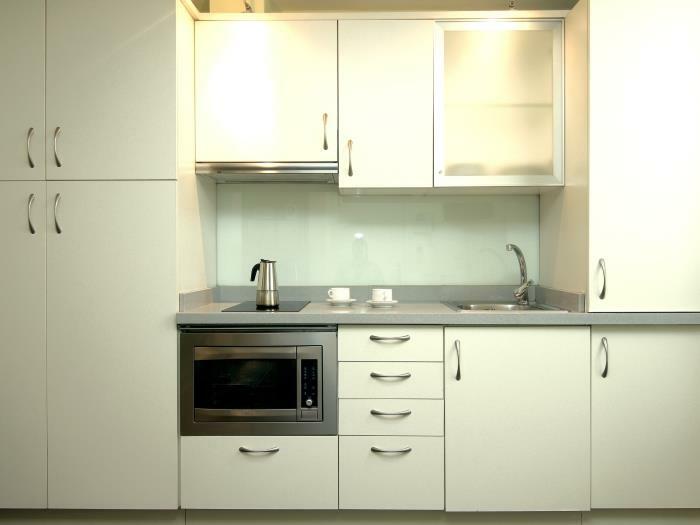 The apartment has some basic amenities but is not really geared for meal preparation. A frying pan is needed. THere are a few nearby places for breakfast and many more lunch and dinner nearby. The apt. Has a roof terrace that was lovely for a loss of wines eating sunny meal. In general, his was a old value in the handy Born neighborhood. Très bien situé. Plutôt bien dans l'ensemble. Equipement ménager minimum. Pas de porte fenêtre, heureusement qu'il y a la terrasse mais il faut savoir qu'elle se situe au dessus de l'appartement et qu'il faut donc monter d'un étage. Le risque dans ce genre d'immeuble avec plusieurs meublés, est qu'il y a un mouvement de locataires pour quelques jours et pour faire la fête si bien que les nuits peuvent être perturbées par le bruit. C'est ce qui s'est produit pour au moins toute une nuit. The ad and the photos in it telled a story about an apartment with a terass in it, well there it was not like that. The terass was on another floor. Also the check in had countless misunderstandings that cost us 50 € and 1 hour. This appartment is convenient for a couple. 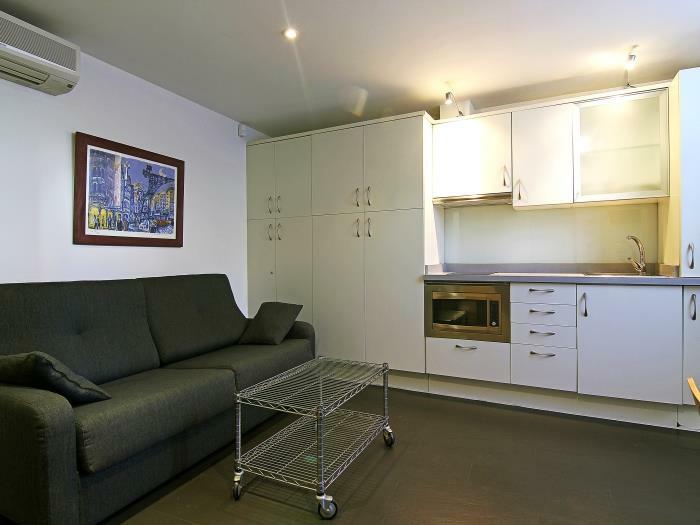 Although there is a sofa-bed, we believe that the appartment is too small to accommodate 4 persons. The location is great! 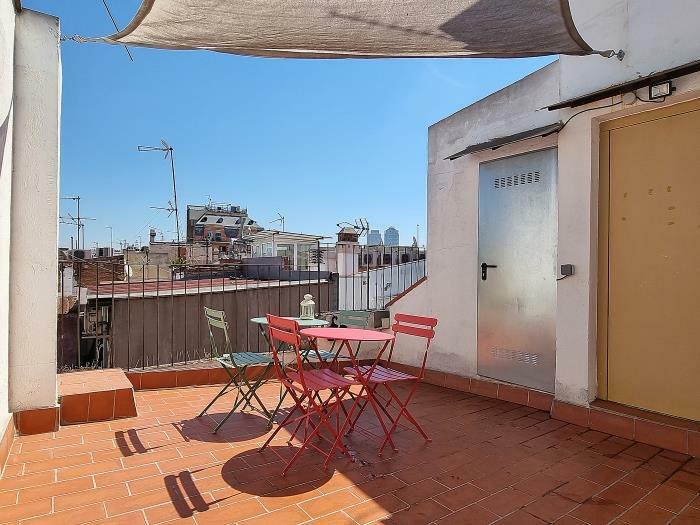 El Born is a lively and interresting area, next to another highly interresting neibourhood (Barri Gotic) and within a walking distance from the beach (15 min walk). 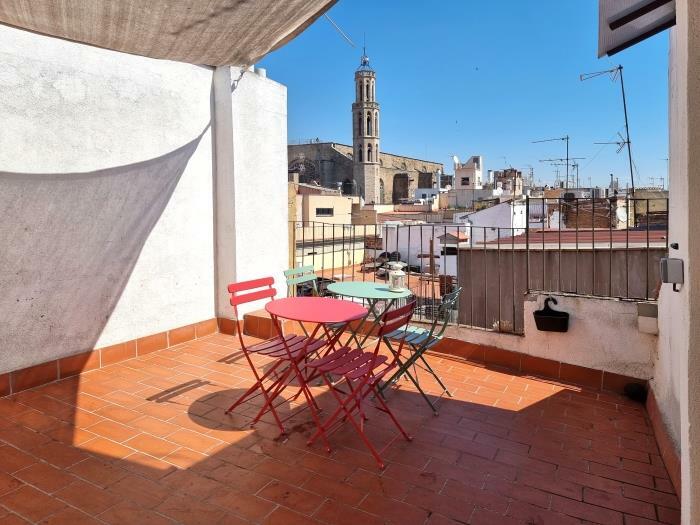 The terrasse offers a breathtaking view of the Santa Maria del Mar church and of the Barcelona roofs! We would sure recommend this appartment. El sitio está muy bien ubicado y el entorno es propio para movilizarse hacia diferentes destinos fácilmente. MERCI POUR L ACCUEIL, LOGEMENT BIEN SITUE , QUARTIER ANIMÉ ET AGREABLE. NOUS REVIENDRONS.SUGGESTION: IL MANQUE UNE PELLE ET UN BALAI POUR POUVOIR FAIRE UN MINIMUM DE NETTOYAGE. 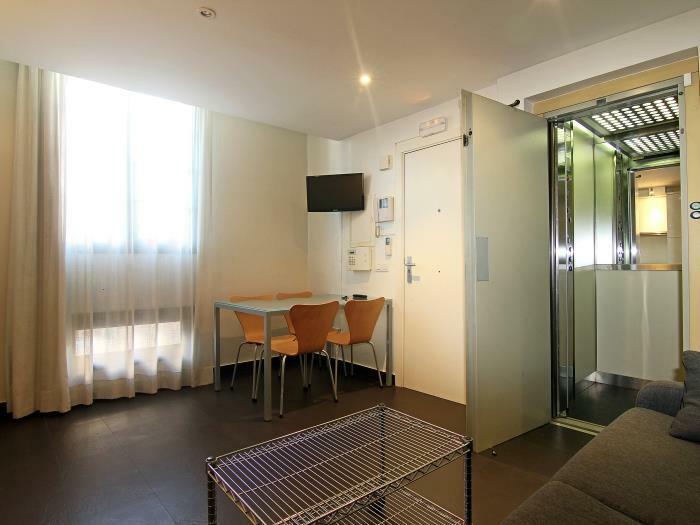 Superbe appartement, bien placé, calme. Nous avons passé un très bon séjour. Locatie is geweldig. schoon. Alles aanwezig strijkijzer fuhn enz. Vriendelijke mensen. Très bonne adresse, bien situé dans le quartier El Born. Petit appartement calme et très fonctionnel. Bien pour un couple ou une famille de 3 ou 4. Nous y reviendrons certainement. L'appartement est très bien situé dans le Barri, bien au calme. Le niveau de confort de l'appartement est excellent, tout équipé, et c'est également très appréciable de disposer de deux jeux de clés. Tout était parfait sauf la douche dont le jet était très faible et la température chaude/froide qui variait sans arrêt. Autrement séjour imppecable, merci pour l'accueil. Nous le conseillerons sans problème. 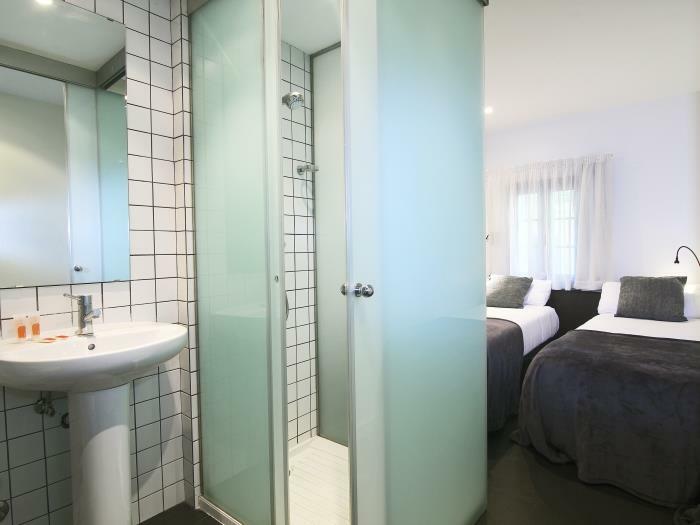 very difficult to find the place, but the room is very clean and enough space to stay. 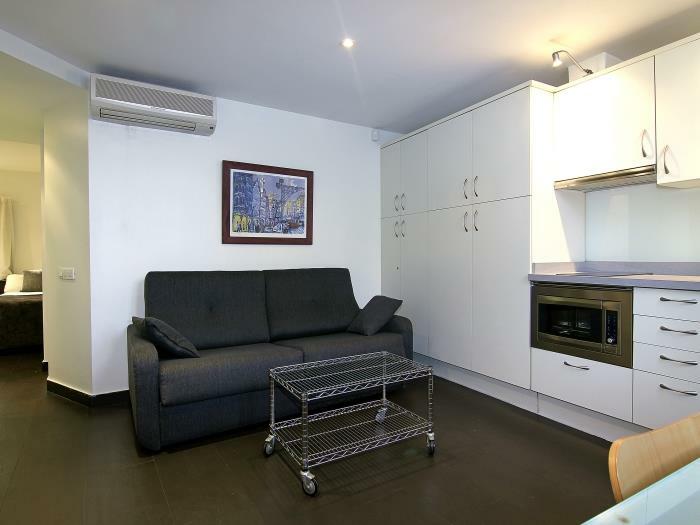 The appartment was nice, looks exactly like the photos, good location between the beach and the ramblas, quiet, clean, internet and air conditioner working very well, no problems with the elevator and it has laundry services at the groundfloor. Ottima scelta per gruppi di ragazzi/e. In pieno Barrio Gotico; vicino a tutto, sia mare, che Rambla, raggiungibili comodamente prendendo la metro più vicina che è a 2 passi. Buon rapporto qualità/location/prezzo. Very fast and good service when our safe failed at our departure. Phantastically located, nicely furnitured, however the dishes were sticky and the bed linnen for the additional bed was not washed. Check-in/out went smoothly. Nice staff! Ubicación perfecta y con mucho encanto, cerca de todo. Habitación cómoda y bien equipada. 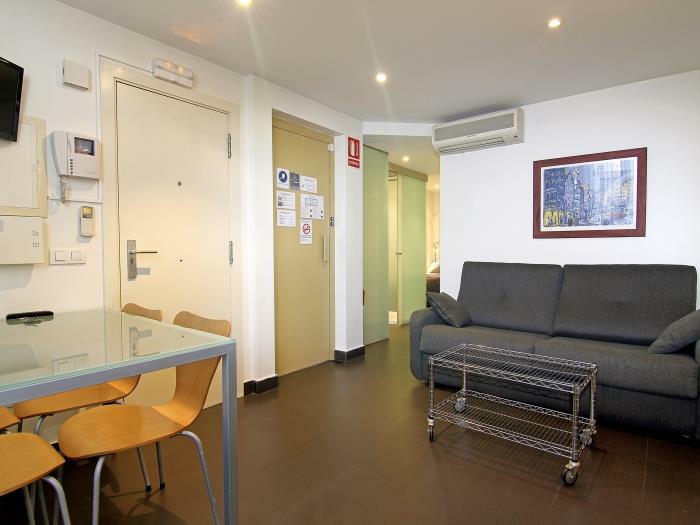 We thoroughly enjoyed our stay in Barcelona and the apartment was good. 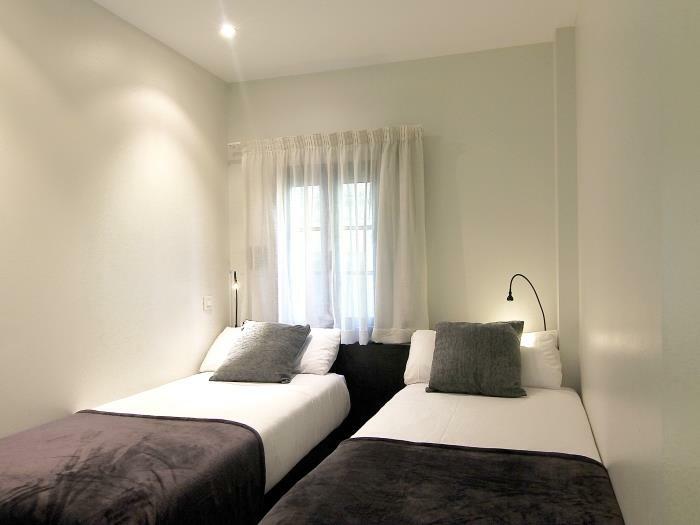 We were able to wash and dry our clothes which was great and the apartment was close to all needs such as supermarket, pubs, tourist areas and only 10 minute walk to La Ramblas. It was nice that toilet paper and dishwashing soap were provided after we asked for it. However, it would have been even nicer if that would have been self-evident and not presented as a special favour. The apartment was very nice but very small. Waren das 2.te mal in den Picasso-Appatements und die Lage ist einfach genial,nahe zum Strand und die Altstadt um die Ecke.Wir hatten zwar in Pisasso 5 keinen Balkon,wie im Web angeboten, aber wir waren trotzdem zufrieden. Die Reinigung der Zimmer könnte gründlicher sein. Beim nächsten Barcelonabesuch würden wir wieder hier einchecken! There was not enough spaces for baggage.Bathroom ventilation was poor.If you want clean the apartmant there is not any vacuum cleaner.